I LOVE Brunch. And I LOVE Eggs Benedict. Poached eggs with unctuously runny yolks? Goooood. Creamy Hollandaise? Goooood. Hence, I turned to the kitchen to fulfill my Eggs Benedict needs. 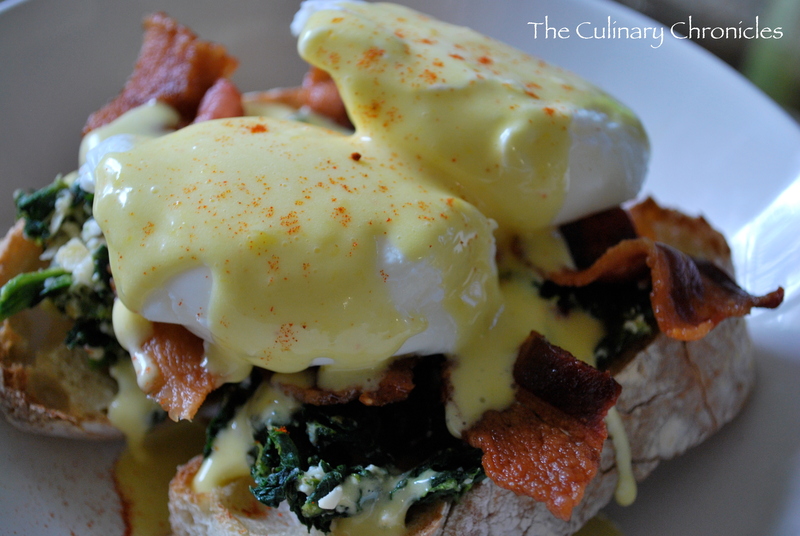 I chose to dress the Eggs Benedict in a Mediterranean style since I had some feta cheese in the fridge. As for the bacon? Well, I’m in the belief that it isn’t a true brunch if bacon isn’t present. I also decided to use some rustic style bread instead of English muffins to go with the Mediterranean theme. It all came together pretty easily and quickly. I loved what the Spinach Spread added to the dish. And let’s be honest, there’s something so darn fulfilling to take your fork and cut into the poached egg. Yolk— gloriously oozing out. 🙂 As for the Hollandaise, it was a tad too acidic for us. I’d recommend cutting the lemon amount in half. All in all, I was happy with the results and my craving was fulfilled. 🙂 Next time you’re in the mood for Eggs Benedict, give this version a try. Spinach Spread: Sauté garlic in olive oil for 1-2 minutes until fragrant but not browned. Add Spinach, sundried tomatoes, and thyme. Cook for an additional 1-2 minutes. Remove from heat and add the cheese. Salt and pepper to taste. Cover and keep warm. Hollandaise: Vigorously whisk the egg yolks and lemon juice together in a stainless steel bowl and until the mixture is thickened and doubled in volume. Place the bowl over a saucepan containing barely simmering water (or use a double boiler,) the water should not touch the bottom of the bowl. Continue to whisk rapidly. Be careful not to let the eggs get too hot or they will scramble. Slowly drizzle in the melted butter and continue to whisk until the sauce is thickened and doubled in volume. Remove from heat, whisk in cayenne and salt. Cover and place in a warm spot until ready to use for the eggs benedict. If the sauce gets too thick, whisk in a few drops of warm water before serving. Poached Eggs: Bring a deep skillet of water to a simmer. Add vinegar. Gently break an egg into a large ladle and carefully lower it into the simmering water. Repeat with the remaining eggs. Poach the eggs for about 3-4 minutes, making sure that the eggs don’t stick together. With a slotted spoon, carefully remove the eggs and rest on a plate covered with a paper towel. To Assemble: Place two pieces of bread on a plate and spread a spoonful of Spinach Mixture over each. 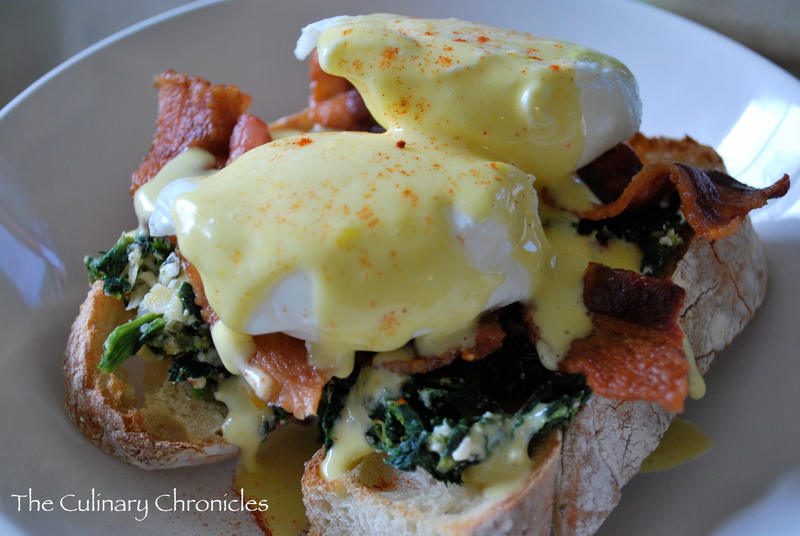 Lay bacon over the spinach and carefully place one egg over each slice of bread. Spoon the Hollandaise over the egg and sprinkle with paprika and ground white pepper. Kalua Pig is so darn good on almost everything that I can TOTALLY imagine how awesome it would be over Eggs Benedict.